This #1 best seller is not only a gorgeous cookbook, with recipes by James Beard Award Nominee, Susan Wyler RD, but it is THE definitive book about Reflux and GERD. It is an easy to read textbook about how to treat heart burn naturally and without medications. If you suffer from acid reflux, you’re not alone. More than 50 million Americans have GERD, or gastroesophageal reflux disease, and while antacids can be effective for short-term relief, they can also cause dangerous medical conditions if they’re used for more than the recommended fifty days at a time. Luckily, The Acid Reflux Solution offers a simple plan to help you gradually and safely reduce—and eventually eliminate—the need for pills while alleviating your heartburn. In this combination medical guide and cookbook, gastroenterologist Jorge E. Rodriguez, MD, has teamed up with registered dietitian and food writer Susan Wyler to present a three-step program to heal heartburn naturally. This isn’t a formal diet plan—no calorie counting required—but you’ll probably shed some pounds while following The Acid Reflux Solution because these recipes were designed for good health. In fact, Dr. Jorge has not only healed his own heartburn since developing this plan, but he has also lost more than 30 pounds! In step one you make some simple lifestyle modifications, like raising the head of your bed, loosening your belt, and eating less but more often. These are easily achievable goals that you can start working on today. In step two, you start eating to avoid reflux. With 100 high-fiber, low-fat, portion-controlled recipes to choose from, this step is the most delicious—and surprising. The list of foods that actually trigger acid reflux is smaller than you might think, which means you can enjoy meals that you probably thought were off limits, like Cuban Black Bean Soup, Grass-Fed Beef and Portobello Blue Cheese Burgers, Asian Barbecued Chicken, and even Spaghetti and Meatballs. In the final step, you reduce the dosage and frequency of the medications you were taking to control your heartburn because you won’t need them anymore. The Acid Reflux Solution combines the latest medical research with reflux-friendly recipes to help you feel great, lose weight, and live heartburn free. I have tried to follow the recommendations in the book…elevated the head of my bed, eating smaller meals more often and avoiding ‘trigger’ foods. I have reduced the amount of Zantac taken from two 150 mg. tablets to one a day. The incidence of acid reflux seems to be less than before trying to incorporate the suggestions in the book. I still need to take an occasional antacid. I have also experienced fewer medication side-effects since adopting a different routine. I have tried other recommended techniques to control my acid reflux. None of the other remedies have worked for me. 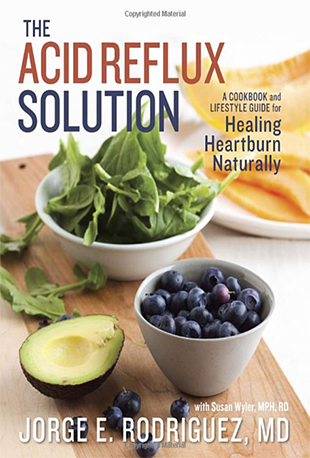 This well-written book has valuable information for people who need help with acid reflux, particularly if they need to lose weight. The writing is clear, concise and conversational. Since portion control is essential to controlling acid reflux, there’s an emphasis on conscious eating, which I found very helpful. I love to cook and eat, the recipes are top notch. I especially enjoyed the beautiful color food photos. The process of cooking up several of the delicious, healthy recipes taught me how to cook this way without a recipe. Highly recommend!